Located near Changi Beach.10-minute ferry to Pulau Ubin and Chek Jawa, 10-minute drive to Changi International Airport, 15-minute drive to Singapore Expo, 30-minute drive to Central Business District and Orchard Road. 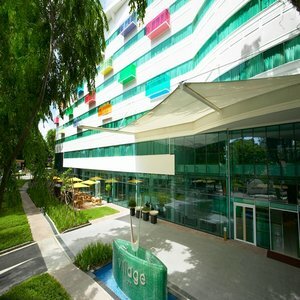 Village Hotel Changi by Far East Hospitality is only a 15-minute drive from Changi International Airport. Situated in the tranquil Changi, the seaside hotel features a rooftop pool and Jacuzzi with views of the South China Sea. Free hourly two-way airport shuttles are provided to and fro the hotel. The 380 relaxing rooms at Village Hotel Changi offer expansive sea or garden views. Each room features a flat-screen cable TV, mini-bar, executive work desk and en suite bathrooms with a bathtub and rain shower. The Retreat Spa and Thalasso Centre provides a range of massage and spa treatments. A well-equipped gym is also for guests to unwind over exercise. Located on the rooftop, the popular La Cantina offers delicious Italian cuisine while overlooking picturesque views of the sea. Chou Bei serves authentic Japanese cuisine as well as an array of fine Japanese wines. Saltwater Cafe features buffets with local and international dishes. For wine connoisseurs, The Wine Company houses an extensive portfolio of food and wine pairings. The Vau Wine Bar is perfect for unwinding after a busy day.